Traversing the lower forest of Seymour Mountain, Bridle Path is the main artery connecting the trails of the Seymour network. For some it is merely a means to an end, a simple path that allows access to other trails they perceive more interesting or more fun. For others it is the end itself, offering short but punchy ups and downs, optional wood structures, and sinewy armoured rock lines that twist through the trees. As with any easily accessed multi-use trail, its popularity demands regular ongoing maintenance to protect it from environmental degradation, alleviate safety issues, and ensure its continued enjoyment by the greater community. The NSMBA has permits from each of the Land Managers that Bridle Path crosses (Metro Vancouver, the District of North Vancouver, Recreation Sites and Trails BC, and BC Parks) to conduct trail maintenance. At 3.5 km long and lots of work to be done, revitalizing Bridle Path is a team effort with the support from TAP sponsors City Sports & Physiotherapy Clinic and Colony Northwoods, the NSMBA Trail Crew, the Arc’teryx Trail Academy, and the Race Face Shore Corps. For 2019, we’re adding one more TAP sponsor on the Metro section of Bridle Path to round out the efforts. If you’re interested, please contact cynthia@nsmba for more information. Work completed so far this year has included repairing eroded sections of the trail, improving water management, replacing aging wood work, and improving trail alignment. In May, the Arc’teryx Trail Academy and Race Face Shore Corps replaced an optional ladder bridge that was showing significant signs of rot and had a broken support. The replacement feature not only maintained the challenge of the previous structure but also preserved the original unique rock entrance. In July, the NSMBA Trail Crew rerouted a section of Bridle Path to reduce the overall footprint of the trail and protect an environmentally sensitive wetland area. Two short sections were decommissioned and replaced with a single more sustainable option. One of the decommissioned sections was a shortcut created by trail users that skirted the edge of a pond and stream. The NSMBA and the District of North Vancouver were in agreement that this line needed to be closed and renaturalized to prevent environmental damage and protect the plants and wildlife. Previous closures of this shortcut were unsuccessful, with trail users removing barriers and reestablishing the trail. Also decommissioned was a short climb over exposed roots. The newly constructed reroute improves the trail alignment by moving it away from the pond and reducing the overall footprint of the trail, thus helping protect the environment. Work this Fall continues to focus on repairing damage from erosion, preventing future erosion, and mitigating environmental concerns. A successful WorkWednesday on September 19th saw 11 volunteers add two new water management features to the trail. Overall our goal with Bridle Path is to improve its sustainability and provide an enjoyable experience for all trail users. Providing an enjoyable experience for all trail users includes many factors as the trail is bi-directional and multi-use. We aim to preserve technical challenge for riders where possible; not just for the sake of the technical challenge itself, but it has other benefits. Technically challenging terrain helps slow the speed of mountain bikers and thus helps reduce the potential for conflicts with other users. 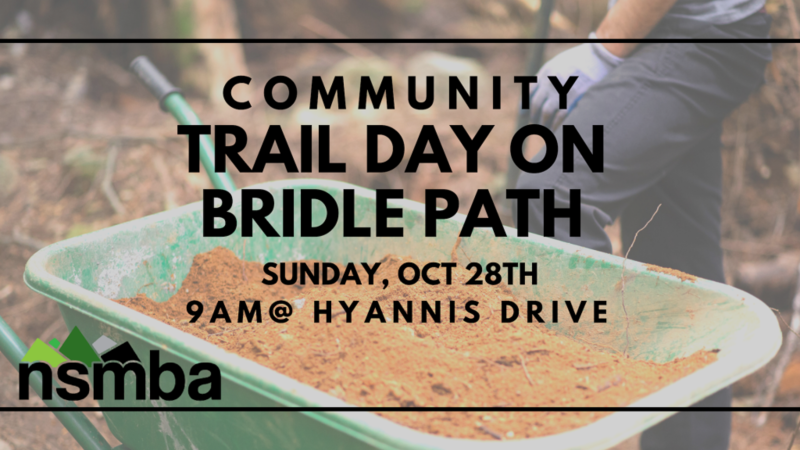 Join us for a Community Trail Day on Bridle Path, Sunday, October 28th. Meet at 9 AM at the top of Hyannis Dr.
Want to learn more about why we make the changes that we do and help out on upcoming projects this Fall? Sign up for the Arc’teryx Trail Academy and become a member of the Race Face Shore Corps.